HTC is a renowned brand founded in 1997 as a laptop manufacturer. The Taiwan-based HTC soon started making smartphones based on Windows Mobile and Brew. HTC released its first commercial Android smartphone, the HTC Dream, in 2008. Today, HTC is a manufacturer and seller of both Android and Windows-based smartphones. HTC made its entry into the tablet market with the launch of Google Nexus 9. HTC’s latest mobile launch is the U12+ and it was launched in May 2018. The phone comes with a 6.00- inch touchscreen display with a resolution of 1440 pixels by 2880 pixels. Loaded with exciting features, HTC has always made its mark in the market. However, HTC phones not entirely free from technical faults. 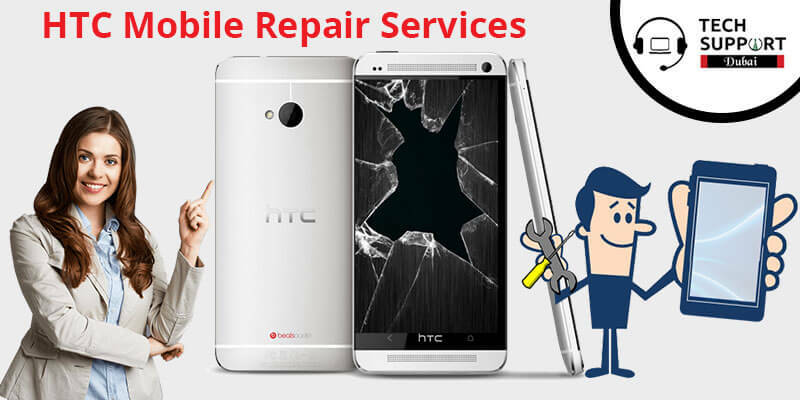 Are you looking for a reliable provider of HTC MOBILE REPAIR SERVICES? Then, all you need to do is connect with our professionals at Tech Support Dubai for affordable and easy solutions. All these issues seem quite a lot to digest at one go. None of the issues listed above is small-scale or less important. If you are facing any one of these, then you are in deep trouble with your HTC model. Catering to these issues on your own can be highly dangerous as it might increase the problem and you may permanently damage your phone. Before you seek for any service provider, check out the services we offer for HTC repair. We have a pool of qualified technicians who are proficient in dealing with any kind of HTC repair. Along with this, our skilled engineers are well-versed with all the latest technological development of the new set of HTC devices and configuring the latest models. It is highly recommended to go only for expert help if you are facing any issues with HTC mobile phones. Place us a call at our helpline number: 042053349 . Our experts at Tech Support Dubai are working round the clock to serve you with exceptional results. With years of experience, our service providers are renowned in as well as outside of Dubai. You can connect with us via Live Chat option and chat with the experts to get valuable insights for an HTC model. Alternatively, you can save your time by emailing us your issues and describing them in details. We will get back to you shortly after receiving the service request. Instead of that we also provide the rest mobile repair solution, click here to see. Feel free to communicate with us and resolve your issues at the earliest.